Godzilla’s just enjoying the ride! Godzilla returns for a couple of panels and then goes on vacation again. Unfortunately, Iron Man #194 has a bunch of stuff about Iron Man in it for some reason. 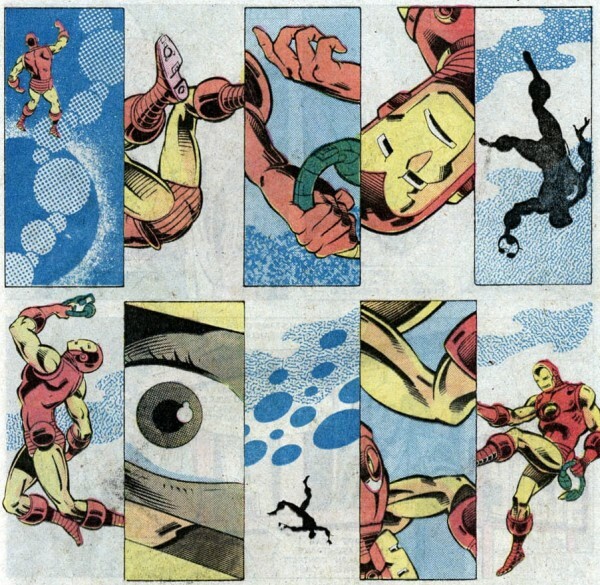 Don’t they know the reason this website is reading the comics 28 years later? Get with the program, Marvel! Stark has been carrying Godzilla over the ocean for an entire minute when his rockets run out of power and he starts to sink to the bottom of the ocean. Whoops! He eventually gets enough of the armor off to get to the surface and breath again, but has no idea where he is as he’s in the middle of no where and a storm is coming. Hawkeye and Mockingbird go looking for him after an hour. 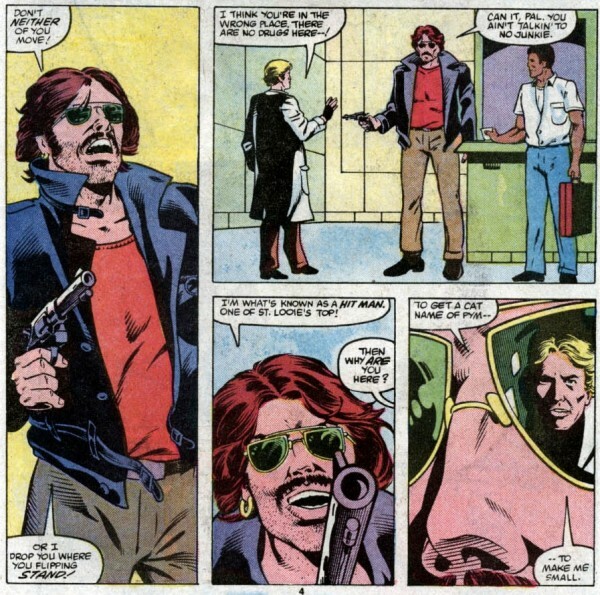 James Rhodes visits Hank Pym, who is currently hip 1970s Owen Wilson Hank Pym. 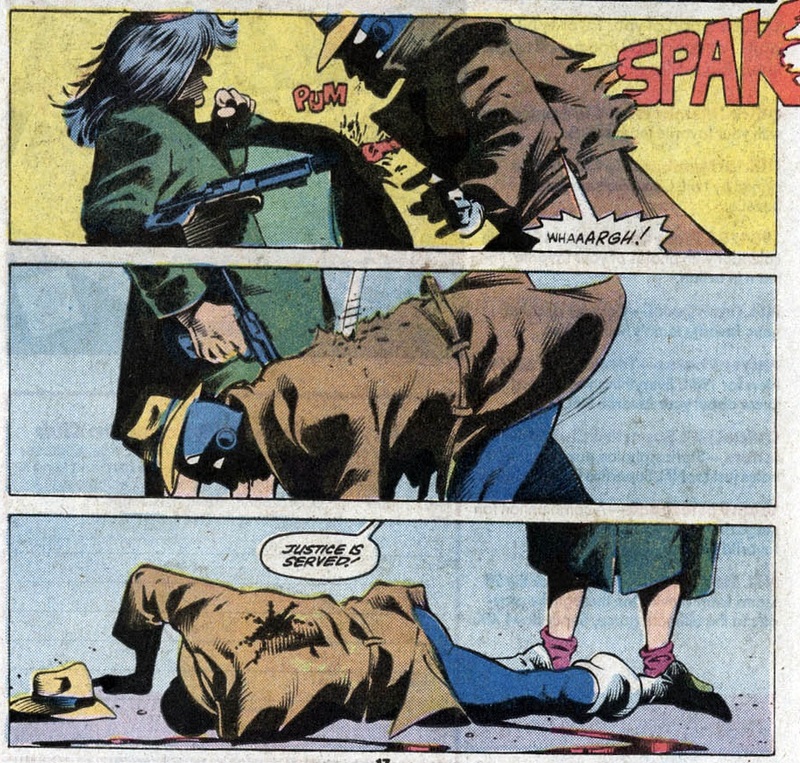 Hank Pym is doing work on other dimensions when suddenly some goober with a gun comes in, demanding Pym make him a few inches shorter so he can evade the cops. Rhodes kicks and punches the guy until he falls into a dimensional portal. Hank Pym is also pulled in as well. Rhodes suits up as Iron Man and goes in after them. Some even more boring sideplots happen with characters unimportant in the giant monster scheme of things. One thing is important in the grand scheme of comic history, as the original Scourge makes his first appearance here in what was at the time something innovative (a mysterious assassin offs a bunch of b-level supervillains randomly in various comics) but has become used a lot and now is not novel. I’ve lost count on what number Scourge we’re up to. Hawkeye and Mockingbird used the Quinjet to search for Stark, but are unable to find him. 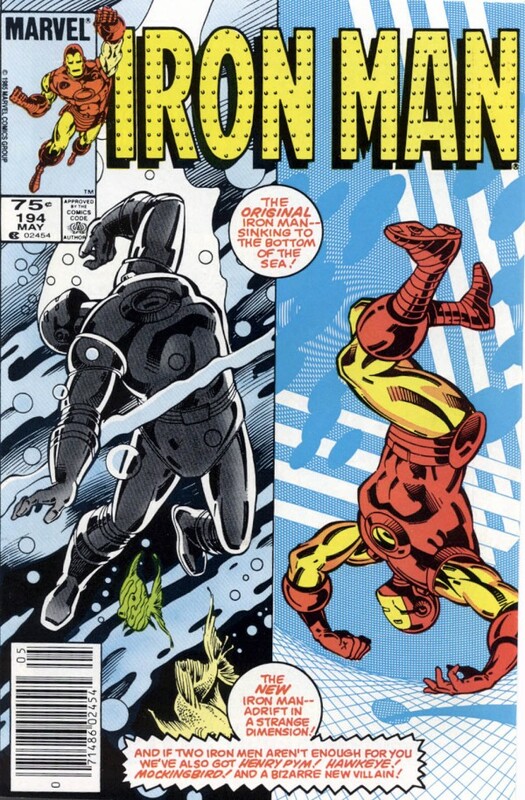 They go back to the vessel that was downed in the ocean last issue, and are shocked to find Stark has swum there. Even more shocking, Tigra has disappeared from this story line and I have no idea where she went! Probably off to flirt with another giant monster. While Rhodes rescues Pym and the weirdo guy with a gun, but the guy with the gun decides the trippy alternate dimension beats jail and jumps back into it! Until next time. 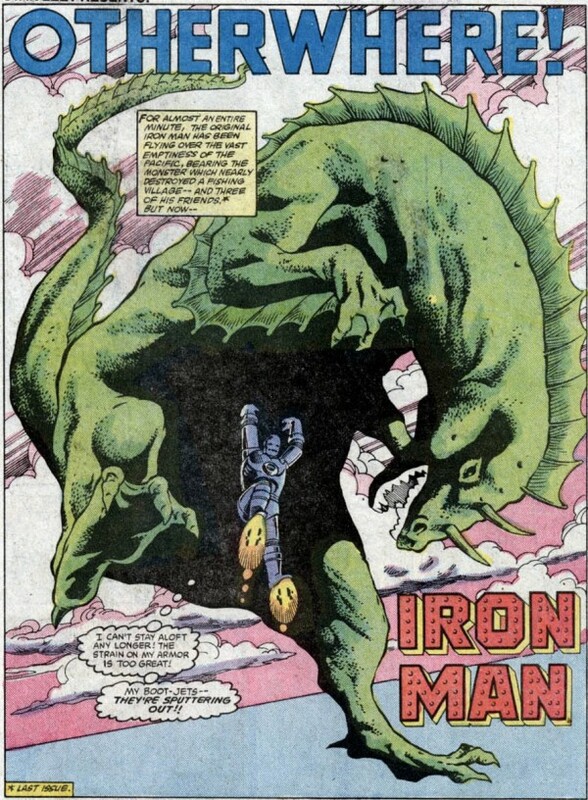 Actually, until the time after next, because Godzilla skips an issue before reappearing in Iron Man #196! The East German Judge gives him a 4.3! Hi, I’m hilariously out of fashion even for 1986! The only thing that compares to this is when a Leprechaun was randomly killing people!